As a child, drawing on the floor and walls with colored chalks was great fun. Possibly because my parents had a high tolerance level. I was not particularly winning awards for my creative pieces then but that never discouraged me. Drawing was more like getting into a secret world that you are most happy spending time in. Why did you choose to be in Design? Design to me happened by accident. I was totally confused about what is that I wanted to become. The fear of becoming anything predictable like a doctor, engineer, army officer, bank clerk or even a government employee made me stay away from those options. I was instead attempting entrance tests for all obscure unheard of courses. The entrance exam to NID was one such attempt. The test itself was great fun and it seemed joyfully fresh. Especially at a time when nobody knew what exactly you will end up doing after you pass out as a designer. 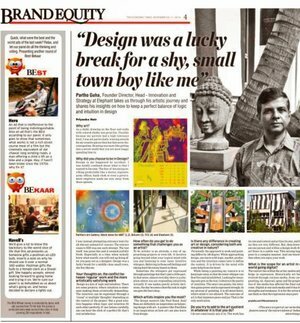 Design was a lucky break for a middle class small town, shy boy like me. Design is a mix of logic and intuition. There are some projects, where intuition is dominant making them artistically demanding. The intuition can be expressed through a 'visual' or multiple 'thoughts' depending on the context of the project. But a great solution happens when logic and intuition fit each other perfectly. If one listens carefully, one can hear the click of a perfect fit: that's real satisfaction. How often do you get to do something that challenges you as an artist? To be artistic is an attitude, a way of approaching projects or even life. It involves going beyond what your logical mind tells you and listening to your inner intuitive whispers. Believing in those soft feelings and taking hard decisions based on them. Sometime the whispers get expressed through paintings but that's just a little part. In that sense, almost everyday there is a situation where you are responding intuitively. Actually if one makes purely artistic decisions, the day becomes cheerful and at night one gets the best sleep. The design masters like Paul Rand, Saul Bass are definitely an inspiration on balancing design with art. A painter like Paul Klee is an inspiration on how art can also learn from design. Is there any difference in creating art or design, considering both are creative in nature? Personally the approach to work and painting differs by 180 degree. While approaching design, one starts with logic, market, production and the intuition comes later to define the context. It is driven by the mind with some help from the heart. Do you try to add to the art quotient in whatever it is that you do? I do not consciously mix it in. The work has its role and context and art has its own, and to me they are very different. But, deep down I am one person and within a design work the art flows in a subtle way. This mixing happens in a complex manner. And one knows that when you enjoy your work. What is the scope for an artist in a world going digital? The real art lies within the artist, media only helps in expression. Historically art has evolved through various media, from cave painting, oil, charcoal, spray and the properties of the media has affected the final outcome. Digital is one such media and it has its strengths and weakness. It is for the artist to use them so that the expression stays pure.